For years now, new fairies have been born everyday into Never Land, keeping the world's most famous fairy—Tinker Bell—company. And like Tinker Bell, each of these fairies have a unique talent, revealed on the 777th full moon of the fairy's birth. Petite is the smallest fairy of all the fairies in Never Land. Her 777th full moon anniversary is approaching, but she is far from discovering her special skill! From reading the wind to creating rainbows, Petite fails at everything she tries, all the time proving that, at the very least, she's able to help her brethren in times of need. With the help of her intrepid friend Dill, will she find her talent in time? The world of Never Land unfolds in this enchanting, magical adventure! 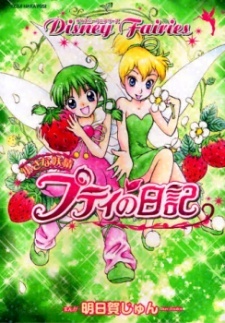 Disney Fairies: Chiisana Yousei Petite no Nikki was published in English by Tokyopop as Disney Fairies: The Petite Fairy's Diary on December 12, 2017.